In a Nutshell: Although 28 million small businesses play a vital role in the U.S. economy, many fail within the first few years, citing cash flow as one of the major obstacles to success. Access to lenders, financial services, and educational resources is integral to starting and expanding a business. Online B2B media company Business.com carries out its mission to help small businesses mature by equipping them with educational articles, guides, and access to over 10,000 companies that provide integral financial services like loans and credit cards. Business.com is a one-stop resource for millions of entrepreneurs to thrive in the modern economy. Statistics from the Small Business Administration show there are over 28.8 million small-to-medium businesses (SMBs) in the U.S., and they play a vital role in our economy — representing 99.7% of total businesses nationwide. But, as every entrepreneur knows, running a small business isn’t easy, especially when you’re getting started. The first few years can make or break a business’s chances of success. As Fundera reports, only one-third of small businesses make it past the 10-year milestone. One thing that impacts an entrepreneur’s chance of success is their business knowledge. It’s important to know how to manage complex finances, market your products or services, and strategize ways to increase profit and revenue. 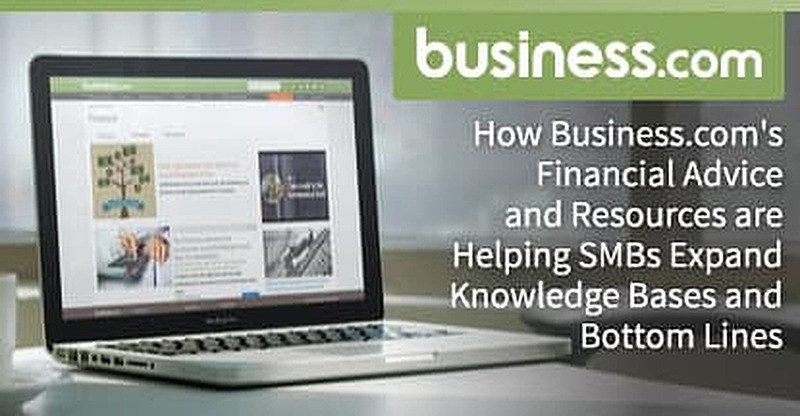 Business.com specializes in helping SMBs gain insider knowledge and advice through informational articles and subpages on a wide variety of financial topics like credit card processing, business loans, payroll, business credit cards, and accounting. Business.com enables and informs entrepreneurs through financial services and educational articles. Initial funding is another obstacle for SMBs. Besides startup expenses, there are continuous practical needs like office space, supplies, and technology services. It’s no wonder cash flow was one of the top 5 concerns small business owners named in the 2017 State of Small Business Report survey. Since it can take a while to turn a profit, access to loans and credit are crucial, and Business.com connects entrepreneurs to small loan providers as well as companies that can provide solutions for credit card processing and payroll services. The site is a comprehensive resource for millions of executives to advance their companies and reach that 10-year anniversary still going strong. If you’re struggling to come up with the funds to run or expand your business, microloans might be an effective solution. In an informational video, Business.com shows businesses how microlending has helped millions of companies scale teams and revenue. Under banking, you’ll find an entire guide about banking options for business owners (whether online or traditional) and articles that keep you up to date on current news, such as how federal policies can affect business loan terms. Business.com’s articles and guides look at factors, such as cost, security, and ease of use, to help businesses determine which credit card processing system is right for them. You can also keep up on preferred payment trends and what’s new in payment technology. Besides microloans, another way to finance small business expenses is through business credit cards, which usually offer higher credit limits than consumer credit cards, as well as rewards on business expenses like telephone bills, internet services, and supplies. If you’ve never had one before, don’t worry. Business.com has a handy e-book titled “Everything You Need to Know About A Business Credit Card.” Further articles can help sort out which one might be the best for your small business. Once you’re educated and up-to-date on important aspects of running your business, Business.com helps you connect to the practical and financial resources you’ve determined you need. Under each category, you’ll find a list of relevant sponsored advertisements from over 10,000 B2B companies. For example, if you’re looking for companies that cater to small business financial needs, you’ll find links to lists of suggested business loan providers and business credit card providers under each of these subcategories, sorted by the types of services they offer. Answering queries about your business helps connect you to a payment processing solution suited to your needs. Business.com doesn’t just list and link to these services, however. As you’re debating among several financial service providers, quote calculators allow you to narrow down your options by answering a few simple questions. For instance, if you’re deciding on a credit card processing system, you’ll start by answering how you receive most of your orders — whether online, in person, or over the phone. The quote calculator will continue to guide you through to the results of which systems are best for your needs. If you’ve already done your research and want to jump right to price quotes for a specific category, you can also access this feature on the main menu bar. The Business.com Blog and B2B Performance Marketing Blog give small business owners the opportunity to converse about current issues. Executives who like to keep their businesses competitive by staying up-to-date on trends can turn to to Business.com’s Pulse analysis, which is a growing collection of whitepapers and surveys on topics such as lead generation strategies. Business.com employees sound off on a variety of topics through the site’s primary blog. In addition to education and news, Business.com gives small businesses access to fun tips and inspiration under Quote of the Day and Hack of the Day. Whether you’re a small business owner just getting started or a seasoned executive ready to take the next step, Business.com provides the advice you need to make wise decisions. Going a step further, the site also connects businesses to the funding resources they need. Launching a small business that can beat the statistics and become a driving force in the economy requires plenty of motivation, business knowledge, and capital. Business.com helps small business owners succeed by offering access to these key resources in one location they can revisit in every stage of maturation. Through educational articles, advice, small business news, and the opportunity to learn from expert opinions, Business.com helps equip entrepreneurs with the knowledge they need to get and keep their businesses on the right track. Realizing that educated business owners are ready to put what they’ve learned into action, Business.com goes the extra step of connecting small businesses with the financial resources and services they need and giving them with tools to make the most informed decisions. By providing both these vital ingredients, Business.com is succeeding at its mission to help businesses grow.